I decided to update the SE ratio information I published in October due to the extra responses received since publishing. The new data is also very interesting and reinforces what we had found before. 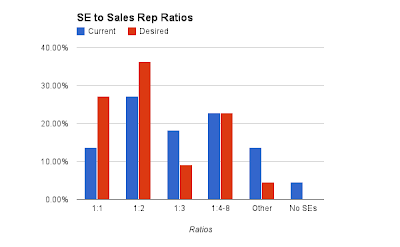 I still see that most organisations want to have a lower ratio (or more SE resource available to each sales rep). There is headcount availability but we can't find anyone we'd like to hire. The ratio completely depends on the product/service being sold. No simple formula applies.